Introduction: Oral health education is an integral part of dental health services and has been provided in various settings such as dental office and dental institutions, school, and other educational institutions, and workplace to improve oral health by increasing awareness and interest of the population toward their own oral health. Aim: To assess the impact of oral health education on the periodontal and dental caries status of the nursing students. Materials and Methods: A total of 1045 nursing students were selected out of them there were 502 males and 543 females. The study was conducted in two phases: first phase, oral examination and second phase, oral examination after imparting oral health education. Statistical analysis included descriptive and Chi-square analysis using SPSS. Results: It was found that both males and females were having highest community periodontal index score of 3 and 4, but after health education, the scores were statistically significant (χ2 = 789.751, P = 0.000, S), whereas the dental caries status remained same, there was an improvement in filled component of decayed-missing-filled teeth after health education, but no statistically significant results were found (χ2 = 735.497, P = 0.574, NS). Conclusion: In the present study, there was an improvement in the periodontal status after imparting oral health education. Therefore, oral health education is an integral part of maintaining dental health. Introduction: Root caries (RC) is considered a serious problem affecting the long-term prognosis of both treated and untreated periodontally involved teeth and has become a major public health problem among adults. Aim: The aim of this study is to assess RC risk among subjects with periodontal disease using the cariogram study model. Materials and Methods: A descriptive cross-sectional study was conducted among 220 participants aged ≥35 years who were categorized as cases and controls based on inclusion criteria. Data were collected using the specially designed pro forma. The clinical oral examination was carried out for recording plaque scores (Silness and Loe), periodontal status, and dental caries experience (World Health Organization 1997). The salivary profile was generated by recording stimulated salivary flow rate, buffering capacity, and microbiological status and risk assessment done using the cariogram study model. Results: Cariogram model revealed 39% and 51% chance of avoiding caries for cases and controls, respectively. Mean coronal caries experience among cases and controls was 14.38± 5.52 and 10.88±5.70, and for root caries was 0.87±1.04 and 0.38±9.85 respectively. Subjects categorized as high risk, according to cariogram had higher mean decayed, missed, filled tooth (DMFT) (16.79 ± 4.58) and root decayed, filled tooth (1.47 ± 1.27) than other risk groups. Active periodontal disease and past caries experience were significantly associated with RC through logistic regression analysis. Conclusion: Cariogram can be a useful tool to illustrate caries risk profiles among periodontal disease patients. Along with baseline RC experience, active periodontal disease, plaque, lactobacilli, and mutans streptococci were identified as major risk factors associated with RC. Introduction: The development and eruption of the teeth, chronologies of human dentitions, dental age, and tooth formation standards are important aspects applied to dental practice. Body mass index (BMI) gives an indication about the nutritional status of the child. It is relevant to know whether BMI has influenced chronology of tooth eruption pattern. Aim: To determine the eruption age of the different permanent teeth and compare eruption age with BMI in a group of children from selected schools in Mangalore. Materials and Methods: A cross-sectional study was designed in which 2928 children ranging in age from 5.5 to 15 years were included in the study. The children were divided into 20 chronological age groups with half year intervals. All the children were examined by a single examiner with the help of a trained assistant. The teeth were examined under natural light with mouth mirror. The comparison was made between mean eruption ages in males and females using the independent t-test. 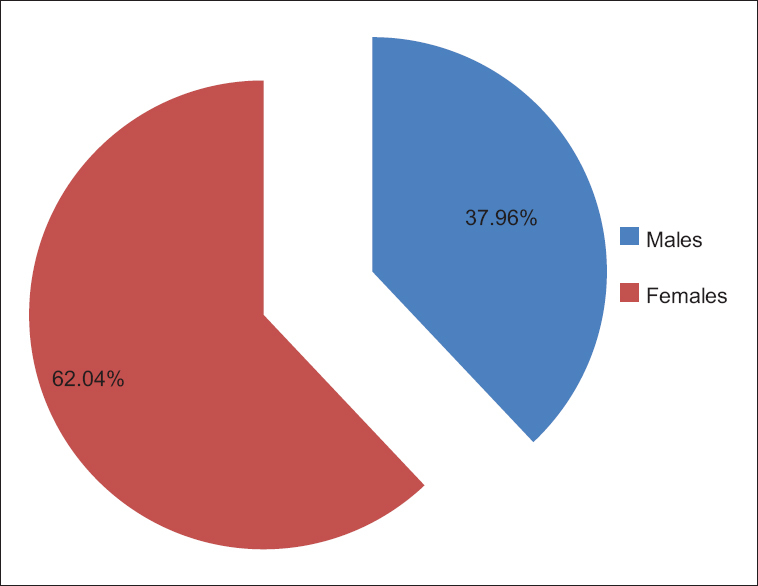 Results: There were 1526 males constituting 52.1% and 1402 females constituting 47.9% of the total sample of 2928 children. The mean age of eruption of maxillary central incisor, maxillary lateral incisor, maxillary and mandibular canines, maxillary and mandibular premolars, maxillary and mandibular second molars were found to have statistical significant with BMI. The mean age of eruption of the teeth in females was found to be earlier than in males, with the exception of the maxillary first molar which is earlier in males. Conclusion: Different categories of BMI were underweight, normal weight, risk of overweight and overweight, wherein overweight children had early eruption of teeth. Girls had early eruption time compared to boys. Introduction: Health is dynamic and multifactorial in nature. Oral health is an integral part of general health. Health personnel, especially in primary health centers (PHCs), can play an important role in grooming health in their patients. Aim: The aim of this study was to assess the oral health status of health personnel of PHCs. 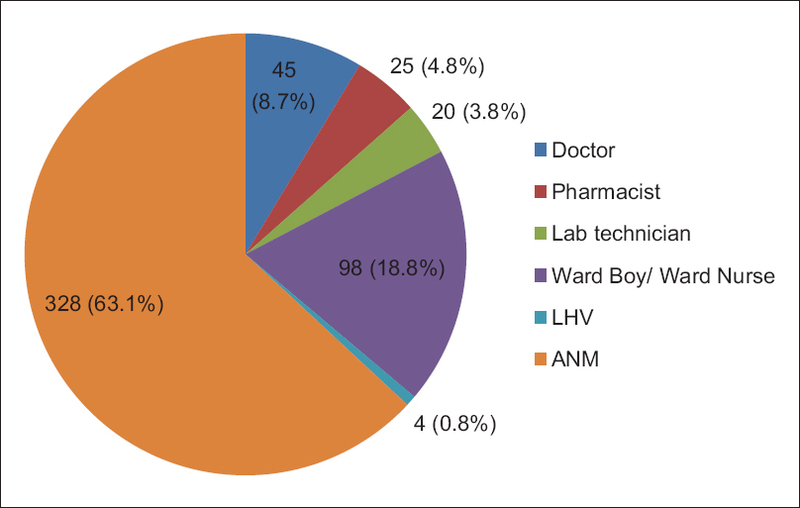 Materials and Methods: A cross-sectional study was carried out among 520 health personnel working in PHCs of Mathura district in the month of September-October 2014. The WHO Oral Health Assessment Form (2013) was used to collect data from each subject. Comparison of oral health status of various health personnel was also done. Results: In the present study, 45 (8.7%) belonged to the upper socioeconomic class, 295 (56.7%) were from upper-middle socioeconomic class, and 180 (34.6%) were from lower-middle socioeconomic class. The mean decayed missing filled teeth was 1.11 ± 2.63 for doctors, 1.24 ± 3.10 for pharmacists, 1.10 ± 3.55 for lab technicians, 1.78 ± 3.80 for ward boys/ward nurses, 0.25 ± 0.50 for lady health visitors, and 1.53 ± 3.16 for auxiliary nurse midwives. The difference among study subjects according to occupation was statistically significant (P = 0.787). Conclusion: The oral health status of health personnel of Mathura district was moderate. These health workers can serve as a valuable resource for population-based health promotion approaches in achieving health for all. Introduction: Industrial employees are often readily available and constitute a well-defined population group although not representing nationwide samples. Aim: To assess the periodontal status, prevalence of oral mucosal lesions, and adverse oral habits among seafood industry employees of Bhubaneswar. Materials and Methods: A cross-sectional descriptive survey was conducted among 21–60 years old 790 seafood industry employees. The questionnaire was designed to record demographic details, routine oral hygiene habits, adverse oral habits, community periodontal index, and prevalence of oral mucosal lesions. 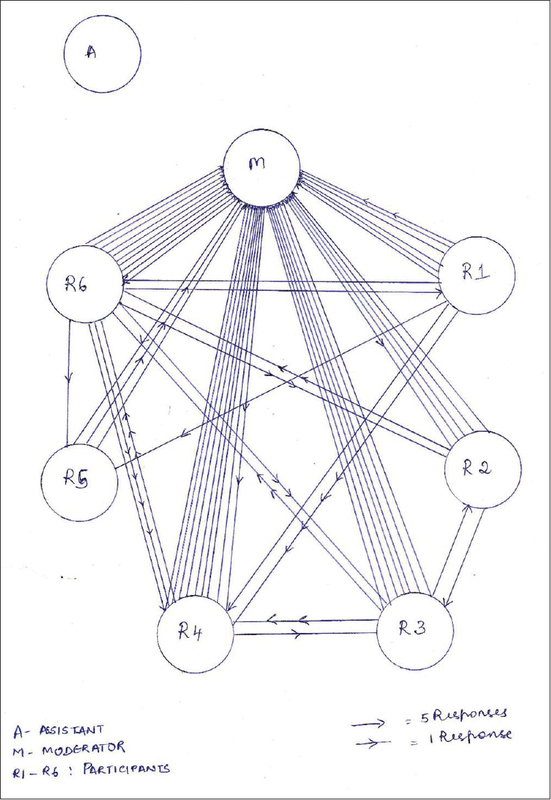 One-way analysis of variance and t-test analysis were used. Results: The majority of the subjects (72.6%) used toothbrush and toothpaste to clean their teeth. Smoking and pan chewing was recorded among 130 (16.5%) and 188 (23.8%) subjects, respectively. The prevalence of periodontal disease was 86.1% among the study population. The prevalence of calculus among the age group 39–48 years was statistically significant across the age groups. Females as compared to males had lower attachment loss levels. About 56 (7%) subjects had leukoplakia and 7 (0.8%) subjects had acute necrotizing gingivitis. Conclusions: The findings of this study provided an insight into the periodontal health status, adverse oral habits, routine oral hygiene practices, and the prevalence of oral mucosal lesions of sea food industry employees, which may be useful in designing and planning oral health promotion programs. Introduction: The number of adult individuals living alone is rising worldwide, especially in India, and their oral health-related quality of life is an increasing public health concern. Aim: The aim of the study is to assess the impact of periodontal status and dental caries experience on perceived oral health among institutionalized adults. Materials and Methods: A cross-sectional study was conducted among institutionalized adults in Nellore district of Andhra Pradesh. Self-perceived oral health was assessed using Geriatric Oral Health Assessment Index (GOHAI). Clinical examination was done for recording the periodontal status and dental caries according to the World Health Organization criteria (1997). Results: A total of 328 subjects were included with a mean age of 69.7 years. The mean GOHAI score of dentate participants was 48.24 (standard deviation [SD] 5.93). The overall prevalence of periodontal disease in the present study was 89.09% and mean caries experience was 10.85 (SD 9.36). There was a negative correlation between GOHAI scores and periodontal status and dental caries experience among the study participants. Conclusion: Low oral health, self-perception is directly correlated with a worse oral health; hence, perceived oral health can be a surrogate measure for clinical oral examination. Introduction: The identification of hepatitis B virus, human immunodeficiency virus as an occupational hazard in dentistry urged all practicing dentists, dental auxiliaries, and dental laboratories to employ appropriate infection control procedures. Aim: The aim of this study to investigate whether there is a scope for improvement in the practice of infection control measures. 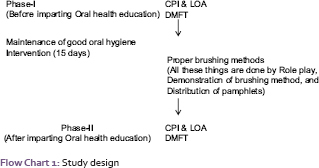 Materials and Methods: A cross-sectional study was conducted using self-administered questionnaire, to obtain information about procedures used for prevention of cross-infection in dental practices. The study subjects, dental practitioners in Guntur district, were obtained using snowball technique. Data were analyzed using SPSS version 19 software. Descriptive and inferential statistics were used to summarize the results and P < 0.05 was considered statistically significant. Results: The mean age of the study population was 36.48 ± 8.94 years. 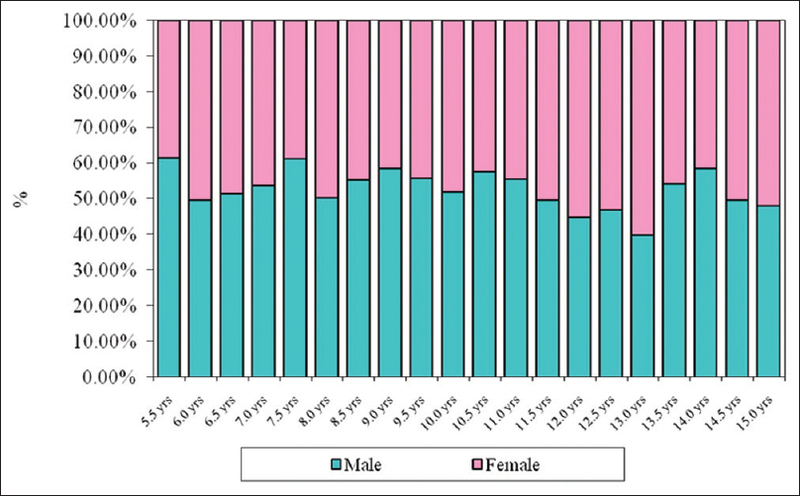 Of the 183 study subjects, 136 (74.3%) were males and 47 (25.7%) females. Of the total practitioners, 45% usually treated ≥10 patients per day, and 52% had the habit of taking medical history for all patients. Statistically significant difference had been found between the practitioners with Bachelor of Dental Surgery and Master of Dental Surgery as their highest qualification, regarding the method of sterilization of handpiece (P = 0.03). Conclusion: This study result suggests that there was a scope for improvement in the practice of infection control procedures among dental care professionals. Introduction: Fear of dental treatment and anxiety about dental procedures are highly prevalent and have an impact on the quality of dental treatment. Use of a means of communication during the treatment procedure, which is the crucial point of communication, is not much studied. Aim: The aim of this study was to assess the perception of patients and practices of dentists regarding the usage of hand signals during dental procedure. 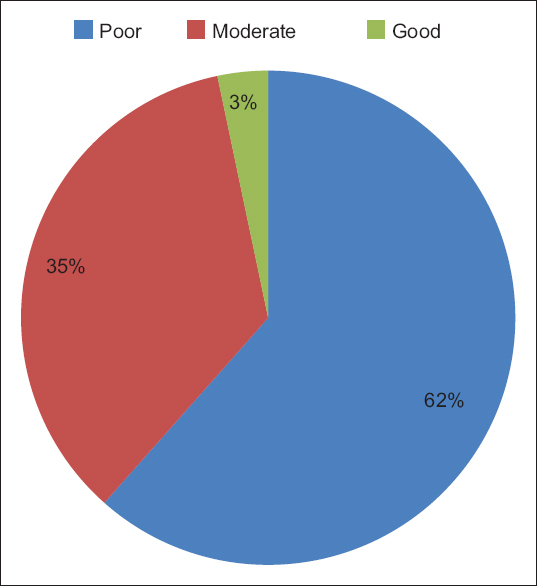 Materials and Methods: A cross-sectional questionnaire study was conducted among 150 outpatients attending a dental institute and 150 dental practitioners practicing in North Chennai. The questionnaire constituted five questions based on difficulty in communication and attitude toward hand-sign usage. The data were subjected to Pearson's Chi-square statistical analysis. Results: About 76.7% (n = 115) of the respondents felt uncomfortable to communicate with dental practitioner when there is instrument in the mouth. About 66% (n = 99) of the respondents experienced fear, when they were unable to express their pain with instruments in their mouth during any dental procedure. Among the respondents, 71.3% (n = 107) agreed that using hand signals during a dental treatment might help them to overcome the difficulty in communication. About 30% (n = 45) of the dental practitioners preferred patients to talk, 54% (n = 81) preferred use of hand signals, and 16% (n = 24) preferred making sounds. About 63.3% (n = 95) of the dental practitioners informed their patients to raise their hand as a signal to stop the procedure. Conclusion: Majority of the practitioners and patients prefer the usage of hand signals over other means of communication to reduce fear and anxiety and improve rapport. Introduction: Early childhood caries (ECC) is one of the rapidly emerging oral health problems requiring anticipatory guidance. Pediatricians are in the unique and ideal position to advice parents about the prevention and treatment of ECC in their children. Aim: To assess the knowledge, practices, and training regarding ECC and infant oral health care among pediatricians in Bhubaneswar city, Odisha, India. Materials and Methods: A cross-sectional study was conducted among 100 pediatricians in Bhubaneswar city using a self-administered questionnaire. Analysis of variance and Student's t-test were used to find the significance of study parameters. Any value ≤0.05 was considered to be statistically significant. Results: Knowledge about ECC and child oral health was found to be significantly higher among male pediatricians (P = 0.03) and those practicing in urban localities (P = 0.007). Confidence of diagnosing (P = 0.006) and practice patterns (P = 0.003) was found to be significantly higher with increasing hours of patient care per week. Conclusions: Most of the pediatricians had better knowledge were confident and performed better practices. Introduction: Most pediatric medicines are prescribed in a liquid form that includes sugar in the formulation. Accumulating evidence, on a clinical and experimental basis, shows a significant association between the intake of sucrose-based medication and an increased incidence of dental caries. Objective: The aim of this study is to assess the knowledge and attitude of pharmacists regarding sugar content in medicine in Bengaluru city. 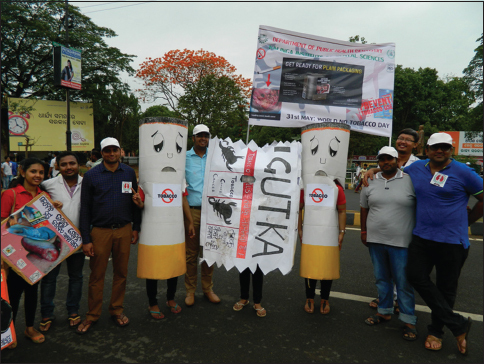 Materials and Methods: A descriptive, cross-sectional survey was conducted among a sample of the pharmacists in Bengaluru city. A sample of 140 retail pharmacist shops were selected randomly from the total list of retail pharmacist shop registered at the Drug Control Department, Bengaluru. Data regarding their knowledge and attitude in relation to sugar content in medicine was obtained using a questionnaire. Results: Around 67.9% of the pharmacists agreed that sugar-containing medicines taken long-term could lead to dental problems. Only 12.9% of pharmacists believed that patient prefer sugar-free medicine. Most of the pharmacists (72.9%) felt that they themselves have an important role in educating people about sugar containing medicine. Conclusions: Pharmacists requires further knowledge about sugar-free medicine. The expansion of the pharmacist role in oral health promotion would be of value to patients/customers. Various methods should be adopted to increase pharmacist knowledge about dental health. Background: In India, people commonly approach pharmacies rather than health professionals for their common ailments including oral health problems. Aim: To assess the type of medication and advice to clients without prescription provided for common oral health problems by pharmacists in Davangere city. Materials and Methods: A cross-sectional survey was conducted in which ten simulated clients visited pharmacy outlets and presented with different oral problems to the pharmacists. The response of the pharmacists was recorded and analyzed. Results: Pharmacists mostly dispensed antibiotics (44.4%), antipyretics (33.4%), mouth wash (60%), and Vitamin B complex (66.6%) for tooth ache, tooth ache with fever, bad breath, and ulcer. Seven pharmacists refused to provide medications without prescription from a dentist. Twenty six (42.6%) pharmacists recommended the subjects to visit a dentist, whereas 35 (57.4%) did not. Conclusion: Pharmacists provided medications to the simulated clients who came without prescription from a dentist. More than half of them did not recommend the clients to visit a dentist. Introduction: Good communication skills can increase the health-care providers' diagnostic efficiency and decision-making ability, as well as lead to improved patient satisfaction. Aim: The aim of this study is to determine the attitude and factors associated with learning communication skills among dental students. Materials and Methods: A cross-sectional descriptive study was conducted among 400 students, studying in various dental colleges in Bengaluru, using a standardized pro forma which consisted of questions on general information, self-assessment of communication using validated Dental Communication Skills Attitude Scale. For statistical analysis, descriptive analysis, ANOVA, post hoc, and Spearman's correlation were applied. Results: Mean positive and negative attitude scores (PAS and NAS) were 50.44 ± 5.83 and 29.72 ± 4.32, respectively. There was a significant correlation of NAS with participant's poor performance in the past examination (r = 0.144, P = 0.004) and self-rating as poor communicators (r = 0.164, P = 0.001). Their consideration regarding teaching communication in dental education was significantly correlated with PAS (r = 0.257, P = 0.00) and NAS (r = −0.308, P = 0.00). Conclusion: Participant's poor performance in the past examination and self-rating as poor communicator had the negative attitude toward learning communication skills. There is a need for integrating communication skills course in the dental curriculum. Introduction: Most dentists will, at some point in their career, be faced with an in-office emergency. Dental staff must undergo training in the management of emergencies to a level based on their clinical responsibilities. Aim: To explore the perceptions, concerns, and experiences of interns after their accident and emergency posting. Materials and Methods: Focus group discussions were conducted among interns in English language in a dental college in Bangalore. Participants individually answered the facilitator's questions and measures were taken not to miss out any question with the help of probes. Both focus groups were audiotaped and lasted approximately 90 min. Audio recordings and focus group notes from the sessions were transcribed, analyzed using qualitative data analysis miner software. Results: Two focus groups were conducted by the authors among interns. After verbatim, the transcript was coded into one hundred and thirty different codes which were broadly classified under eight different categories and these categories were grouped into four different themes. Interns had good and bad experiences during their posting. They said that this experience was once in a lifetime and exposure like this will help them in future to manage emergency cases in the dental clinic. Conclusions: Dental interns were aware about their shallow knowledge of medical emergencies, and they felt there is room for improvement regarding self-estimation of competence in emergency management. Hence, they suggested that emergency postings should be introduced early in their curriculum. Introduction: Infection control practices are crucial and important elements in clinical dentistry as there is an enormous increase in the prevalence of infectious diseases among dental patients. This necessitates the application of recommended procedures for infection control in the dental schools and clinics. Aim: The aim of this study was to assess patients' perception toward the use of protective barriers (such as gloves, face masks, and eye goggles) by working dentists in a private dental teaching school in Jabalpur, Madhya Pradesh (India). Materials and Methods: A cross-sectional descriptive study of a convenient sample of patients visiting the dental school of RDU was conducted in 2015. A structured, close-ended, self-administered questionnaire was distributed among 700 patients and a response rate of 89% was obtained. The questionnaire consisted of a series of questions related to awareness, knowledge, attitude, and perception of patients toward infection control measures. Data analysis included frequency distribution tables. 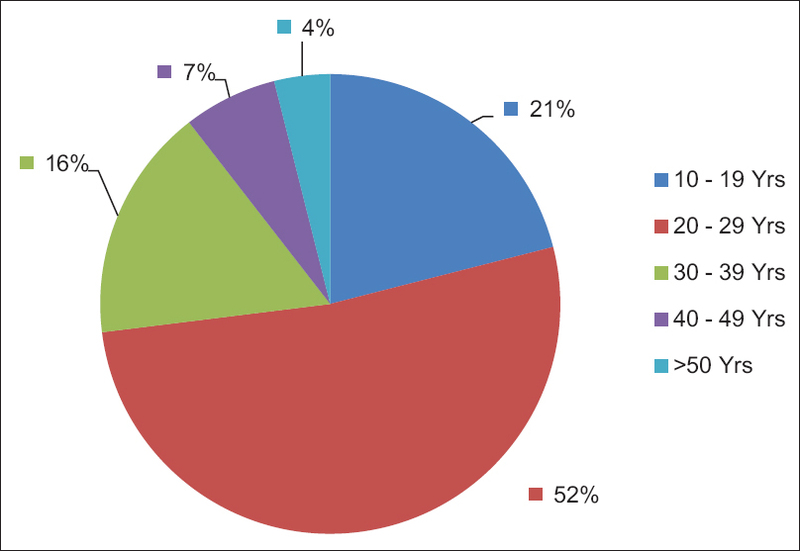 Results: Of 664 patients (298 males and 366 females), 97.7%, 93.5%, and 43.6% of the patients believed that dentist should wear gloves, face masks, and eye goggles, respectively, when treating patients. The majority of them (95.3%) refused to undergo treatment if the dentist is not wearing gloves and face masks. More than two-thirds (73.3%) denied receiving treatment from a dentist, who is not immunized against hepatitis B. Nearly 79.2% of patients refused to attend school if they knew that human immunodeficiency virus (HIV) and hepatitis B virus (HBV) patients treated there. The majority of patients (92.7%, 72.3%, and 23.1%) believed that gloves, facemasks, and eye goggles protect both dentist and patient, respectively. Only 44.9% said that autoclave is the best method of sterilization. A significantly higher knowledge of infection control was observed among the previous dental visitors compared to the first-time visitors (P < 0.05). Conclusions: Patients revealed adequate knowledge toward the use of gloves, face masks, and eye goggles by a dentist. However, their knowledge regarding the use of autoclave was poor. This documentation will serve in planning more effective interventions to enhance public awareness about infection control in dentistry in Jabalpur city, India. Introduction: Dental caries occurs as a result of demineralization-remineralization phases occurring alternately at the tooth surface. Fluoride varnishes have a caries-inhibiting effect on teeth through remineralization. The resulting enamel is resistant to acid dissolution. 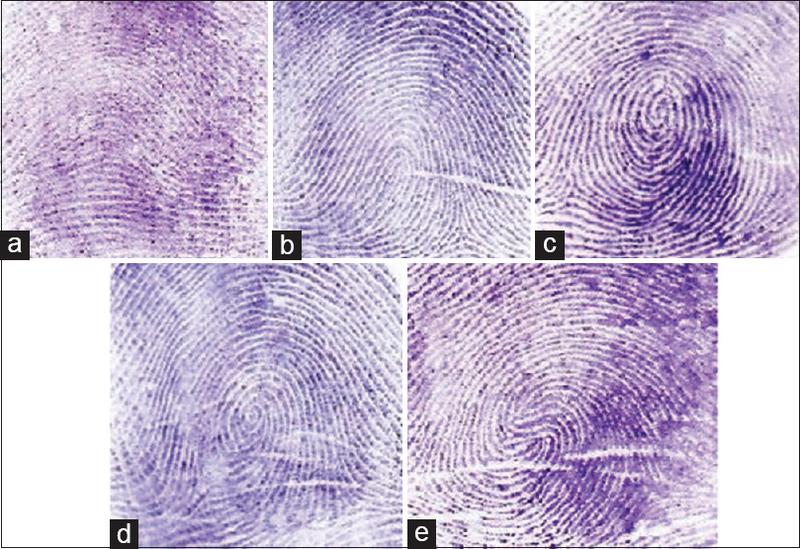 Aim: The aim of this study is to assess enamel surface microhardness (SMH) following varnish application with different fluoride concentrations. Materials and Methods: Ninety freshly extracted, caries-free premolar teeth were used. Teeth were sectioned to obtain enamel blocks from the buccal surface of crown. The blocks were serially polished and flattened, embedded in acrylic blocks and smoothened to achieve a flat surface. The samples were divided into three groups, namely, A, B, and C consisting of 30 enamel blocks each. In Group A, Fluor Protector® varnish and in Group B, Bi-Fluorid 10® varnish was applied. Group C served as controls. All samples were subjected to a demineralization-remineralization cycle for 7 days. The SMH of enamel was measured. Data obtained was subjected to statistical analysis using the Student's t-test and one-way ANOVA. Results: The mean values of enamel SMH of Groups A and B were 496.99 ± 4.81 and 449.47 ± 7.37 Vickers Hardness Number, respectively. Conclusion: Fluor Protector varnish showed significantly higher enamel SMH than that of the other two groups (P < 0.05).